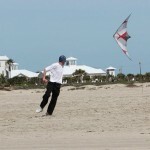 My first introduction to modern kiting was with a dual line, and my interest has been primarily dedicated to maneuverable kites since then (as you’ll find reflected in the info below), but you can find a wealth of information about ALL varieties of kiting on the American Kitefliers Association website. With 20+ years and lot of experience in nearly all of the kite disciplines below (personal passions), my flying skill does vary with each one but I’m 100% confident teaching any of them to someone else – also remember, the world of kiting is so big and innovative that it’s impossible to cover everything – test, learn, adapt, follow your muse and have fun along the way. Even if we narrow kites down to a few basic genres, there are so many children and sub-children from each one, as well as innovations trhat defy the category they originated from… The three styles below strictly cover the over-simplified categories that I favor in my own passions, it’s not even close to an end-all list. 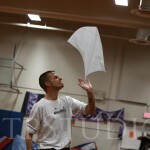 Single Line Kites - just one string, but still fun and versatile. Likely the most familiar to an average person, single line kites fly on one string (we call it a line) but the urban or indoor models that I prefer tend to be simpler in design with some maneuverability and long gliding ability… These characteristics make flying the kite very easy, so much so that elderly or physically limited individuals can still find freedom in flight. 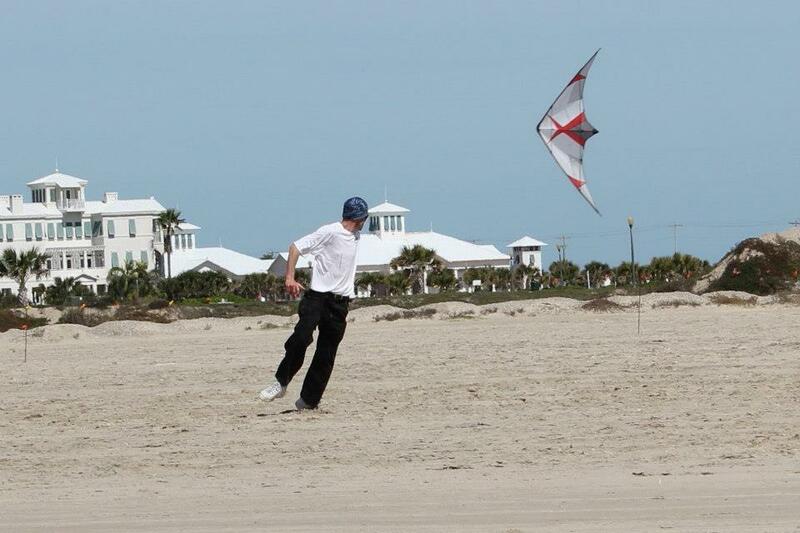 Speaking strictly toward controllable single line kites, the basic principle for flying them has to do with pulling in (power/flight) and letting out line (turn/glide) while you fly, using subtle right and left inputs in combination with speed control to perform a variety of movements. One of the major advantages of a good indoor / urban glider is that you can quite literally fly these kites just about anywhere… Your living room, office, hotel lobby or train station, glider kites have taken spontaneous guerrilla kite flying to a whole new level. Indoor models tend to be super, super light to make up for the absence of wind, while urban gliders tend to be a little stronger (added weight) for variable winds and outdoor impacts, both can be used almost interchangeably if wind and skill allow. Dual Line Kites - classic with two strings, pull R/L for turns and tricks. One of the two most common controllable or “stunt” kites, many of us remember these as basic diamond or pyramid (“delta”) shapes made with aluminum, fiberglass or other materials… When a dual line kite is launched in enough wind, it is a “nose forward” flier that responds to pushing or pilling on the right and left lines, steering the nose where you want while flying forward. These days, with super light carbon frames and over 20 years of design evolution, dual line kites can still be flown elegantly but are definitely more apt to faster flight speed, more aggressive movements and rotational tricks – I always describe dual lines as the “electric guitar” of sport kites, full range but capable of some really dynamic and high-paced maneuvers both indoors and out. First is “slack line” tricks, wherein the kite is partially unstable and can be laid on it’s back, rotated, flipped and rolled up in it’s own lines through an infinite variety of combinations that make the kite appear as if it’s a yo yo, and not really flying under power. Second is precision, which generally comes down to being stable, with solid drive, cornering and very controllable oversteer, the far extreme of this might be described as “driving a truck”… Can’t trick, but it’ll fly a straight line and turn corners like nobody’s business. Alas, after flying literally hundreds upon hundreds of dual line kites over 20+ years of development and technology advancement, I’ve found that most pilots tend to prefer either tricks or precision… I truly enjoy both, but getting the right balance of trick and precision is tricky and the kites I would personally consider true “all rounders” are far and few between. Quad Line Kites - forward/reverse, hover, rotation and speed control. If dual line kites are the electric guitar, then quad line kites, particularly those such as the Djinn and other similar styles, would be the equivalent of an electric saxahone… While they generally lack that “straight and true” forward drive and R/L steering, controlling the kite with four lines gives you the ability to affect any edge of the sail to make it fly in any direction. Forward or reverse at any speed, sideways flight, pivot on a wing tip or rotate on dead center or hover mid-air in any orientation – a skilled pilot can very gently place one wing tip into a 1″ hole at over 100 feet away, or do a blazing dive at over 50 mph and stop on a time without hitting the ground, all of which also makes Revolution kites very popular for team flying. The versatility of quad line kites gives them more fly time than my dual lines, but they both provide a very different flight sensation, I’ve learned a lot from the comparative experience and I couldn’t live with just one. Again, please remember that this is a list of kite disciplines as they’re relevent to my own interest as a kiteflier… I encourage you to research, try and learn about of much as kiting as you can because it will increase your knowledge and skills with kiting as a whole – but, there are other websites and forums for any topics not covered here. Outdoor Flying - traditional venue, cleaner wind, more space. This is the place where most folks know kiting – the classic image of being outside with a string in hand, feeling the wind… An ideal venue assuming you’ve got at least one third to one half mile of mostly flat land behind (upwind of) you and have enough space to fly, the wind is generally cleaner and most consistent, some outdoor flying locations sometimes provide what can only be called “lab grade wind” that is so clean, the only variables are coming from the pilot. With a natural wind direction and enough power in the sail, the experience is generally more forgiving and understandable for the uninitiated, wind usually blows in one direction on the beach (providing a clear wind window) and it just comes down to managing your control and line tension from the hands. 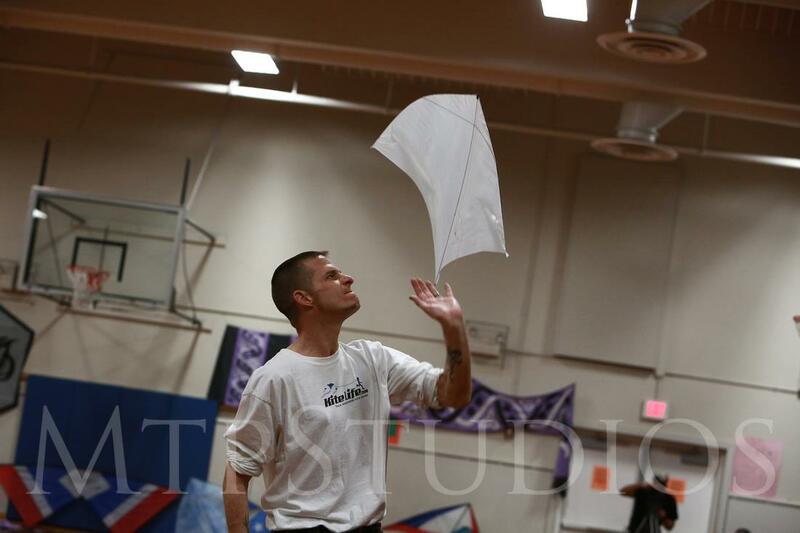 Indoor Flying - zero wind, kites are powered by body movement. Indoors? What, do you use fans? How is there wind inside? Assuming you’re inside now, hold your right hand out flat in front of you like you’re going to shake hands. Don’t move… Most likely, it’s pretty safe to assume that you’re not feeling any wind where you are. Now, wave your hand slowly back and forth, left to right, like a fan… Feel a soft breeze? Wind is air, or atmosphere, that is being moved by a variety of natural forces (heat, cold, etc, etc), it’s still in it’s natural state (still) but when it’s windy, the air is rushing past us, pushing against our sails, giving us lift. Indoors, the same concept of air is there but without the elements required to make it move, so the pilots move through it (same as waving your hand) at varying speeds… It really doesn’t take much to power a kite, especially when there is a lot of sail area (pressure) and super light materials – so even a casual walk around a room can be enough to fly a kite indoors, if you know how, and you believe. There really is no limitation of kite style (single/dual/quad) indoors, it all comes down to flight efficiency, weight and control. Team Flying - multiple pilots, in controlled flight formation. Now – how about being in the midst of a team of kites, flying with maneuvers, commands and entire routines like the Blue Angels? Three or more pilots standing in a line, using their hands, bodies and communication to fly amazingly complex maneuvers that send kites and lines weaving around one another, only to unwind and seperate dramatically at key points in the music – absolutely, one of the most amazing things to watch in kiting. Flying either dual and quad line kites, kite teams have been in existence since the early 1980s and have only been getting more and more complex over the years as we’ve seen advancements in both skill and kite design… At high point (1991-1992) it was very common to see 10+ masters class teams showing up at ranked events for a shot at a national championship – every team has their own style (fast, slow, difficult, graceful, etc) but in the two examples below, you can see some of the changes which have occurred in team flying during the 16 years between these recordings. As you can see, dual lines give a very “Tron-like”, linear, faster top speeds and explosive visual effects… All speed control is done by moving forward or backward, and because you don’t have brakes like a quad line, you’re fairly well committed once you’ve turned so timing and execution are a great more difficult for novice and intermediate fliers to learn – worth the work, but it takes more work and regular practice to master. On the other spectrum, quad line kites with multidirectional and speed control ability have made easier for folks to get into team flying… With a specifically social, expandable and educational sub-culture driving it, quad team flying started to really gain popularity in 2005-2006 and has become one of the most visible kiting pastimes in the world with dozens of exhibition teams worldwide, mega flies with 80+ pilots in formation, workshops/clinics and a wide distribution of international standards for team flying. Urban Flying - even with less than ideal wind, it's still cool. Urban flying is a loosely used term that basically means anywhere you wouldn’t normally expect to fly a kite, but almost always in a developed area. What this does to the wind is likely unimaginable for someone who hasn’t experienced it first hand… Buildings of various heights, trees, streets, parking garages, light posts, park benches, fountain parks, you name it, the possibility for unique venues and conditions is nearly limitless, particularly if you are using a shorter length of line (often in the 10′ to 50′ range). Safety is a VERY, very important aspect to urban flying with electric lines, pedestrians, vehicles, animals and whatever else in in a public environment – this sort of flying not to be done lightly, but it can be amazing when done with proper precaution and respect. Water Flying - aerodynamics vs hydrodynamics, both are dynamic. Getting stranger yet, let’s explore the interaction of kites with water… I wrote an article about flying kites around water for KiteLife I won’t get into this in too much depth here, except to express my personal excitement about it and encourage you to read the article to see just how broad a subject it can be. To say it simply, other than moving at different speeds, being affected differently by gravity and having extremely different density, both air and water behave similar to a fluid across the surface of a sail… They both route pressure along similar angles and create drive, but water is exponentially heavier and slower. Nuff’ said, read the article for info! Dogstake Flying - allows the pilot to be downwind with their kite, interacting. Time to bend it like Beckham, quite literally, as we bend our lines around a stationary object so they run in a “V” pattern and allow us to actually stand downwind to interact with our kite while controlling it through a ring or pulleys… This is another topic that I’ve written pretty comprehensively about, so I’ll keep it brief – check out the videos below and read the article. What I will say is that this is absolutely one of the most unique and interactive forms of sport kite flying I’ve ever come across… When I’m down at the end of those lines, I feel the kite moving near me, it becomes a friend, a combatant, or a graceful shadow giving me respite from the hot sun – and sometimes I swear, I can hear it breathing and whispering sweet nothings to me. Multiple Kite Flying - piloting multiple sport kites independently. I’ve seen pilots use a variety of methods to fly as many as five dual line kites simultaneously, each being controlled independently by the same person… It’s quite amazing to watch, I sort of alright with one dual and a quad but the dynamic of learning and coordinating three kites struck me a bit like rubbing your head and patting your tummy, multiplied by a million – flying one kite is often so familiar, that those old right-left habits want to take over even when you might be controlling one kite entirely from a single hand. 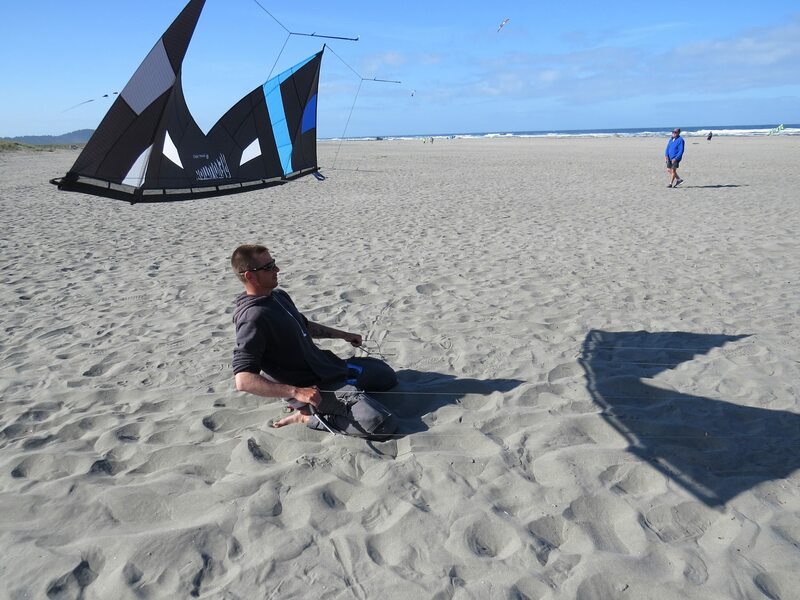 In addition, you might want to read Gustavo Di Si’s excellent guide to Multiple Kite Flying – parts one and two of this article can be found on KiteLife. 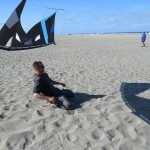 It’s a big, big kiting world, and I only hope that I’ve fanned the ember enough – go fly!